I got this MAC Technakohl Liner Eye-Liner Kajal last December 2011 during the official launch of MAC Cosmetics at Rustan's Ayala Center Cebu. It is from the Glitter and Ice collection, so I'm not so sure if this is still available now. A mechanical pencil-style liner. In formula, soft and creamy, with an intense, rich, colour deposit. Blends on application: dries quickly to a long-wear, non-smudge finish. Versatile. An easy way to line the top and lower lash line of the eye. When applied at a 90 degree angle, provides a thin precision line. For thicker application, apply at a flat angle. I've been using this eyeliner quite a lot ever since I got my hands on it. Although some people might find this color unconventional but it's actually really pretty. So far, this is the first eyeliner that I'm really impressed with. I've used several waterproof pencil eyeliners like Styli Style, Prestige, NYX and etc. but this is the only eyeliner I've tried that lasts long on my waterline. I like using this shade on my waterline since it doesn't look too harsh like the typical black eyeliner does. It still defines my eye but it looks softer and more subtle. Although this is pricey, I do feel like I got my money's worth. 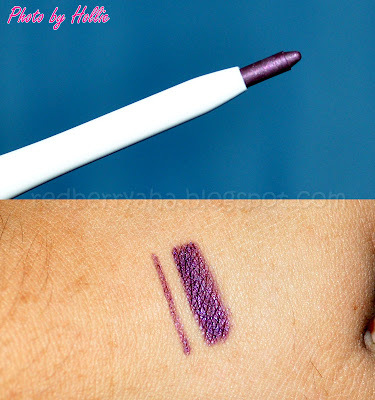 If you can't find this shade, you can check out Technakohl Liner in Purple Dash. The only difference between the two is that Fancy Moves has glitter while Purple Dash doesn't. Do let me know your thoughts on this product if you've tried it.